Walkers announce a new recycling scheme for crisp packets! Breaking news: Walkers have just announced they’re launching a scheme to recycle crisp packets. It’ll mean fewer crisp packets going to landfill or washing up on our beaches. And it’s down to you. 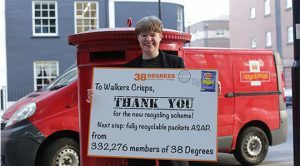 The new scheme will put special crisp packet recycling points across the country. It’s not perfect – Walkers need to do more to make their packets properly recyclable everywhere. But this is a huge step forward. Moments like this show how powerful we can be when thousands of us group together – small actions like signing a petition, sending Walkers a tweet, posting a crisp packet, it all adds up and makes us a force to be reckoned with. And that’s what 38 Degrees is all about, it’s named after the angle at which snowflakes gather to form an avalanche. So thank you for being part of it.